Clips allow for easy storage and retrieval of image objects to and from the clipboard. The Copy tool and Paste tool are frequently used in combination with Clips. 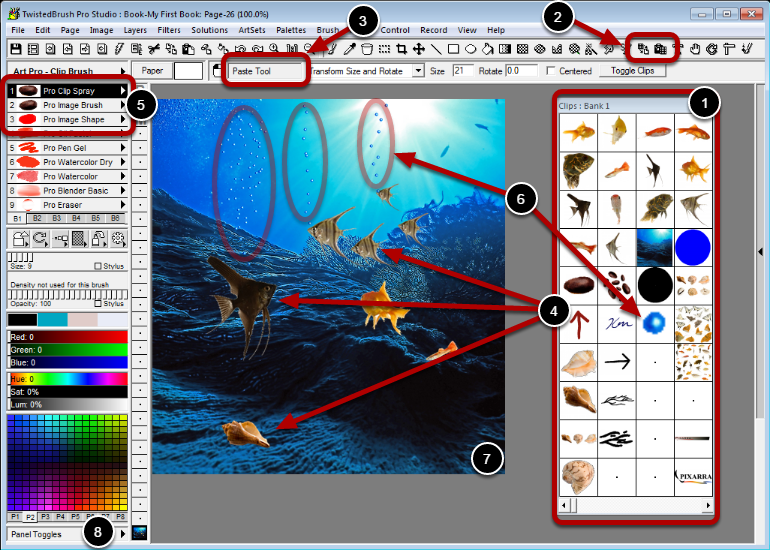 The Paste tool is selected and was used to place the fish and shell on this image. Clips were selected from the Clips panel and pasted into the page. The whole background image was also a Clip and put in the page at the start with the Paste as New Image action from the Edit menu. The Clips Bank can be launched from the Panel Toggles menu, from the Toggle Clips button on the Paste tool option bar and it also appears automatically for Clip brushes, Image brushes and Image Shape brushes. The Clips Bank title shows the current bank number. There are up to 100 banks of up to 40 clips each. Right click on a clip or clip slot to show the popup menu. Click on a clip to copy it to the clipboard reach for use with the Paste too, Pro Clip, Pro Image Brush and Pro Image Shape brushes or even in other programs to paste. The scroll bar is used to select the bank 1 - 100.